Välkommen till Javier Arandas licentiatseminarium i ämnet elektronik. 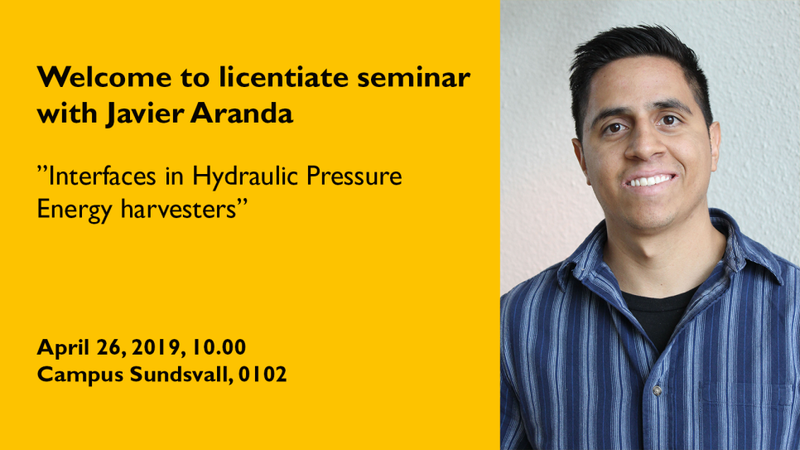 Javier presenterar sin avhandling "Interfaces in Hydraulic Pressure Energy harvesters. Opponent är Professor Olfa Kanoun, Chemnitz tekniska universitet. Seminariet hålls på engelska. Title: Interfaces in Hydraulic Pressure Energy harvesters. The fourth industrial revolution is here and with it a tidal wave of challenges for its prosperous implementation. One of the greatest challenges frustrating the development of the internet of things, and hence the next industrial revolution, is the powering of wireless sensors, as these depend on batteries with a limited lifetime. Recent advances have shown that energy harvesting technologies can be employed to extend the lifetime of batteries and ultimately replace them, thus facilitating the deployment of autonomous self-powered sensors, key components of the internet of things. Energy harvesting is the process of capturing ambient energy and converting it into electric power. For energy harvesting devices it is crucial that the transduction of energy is as efficient as possible, meaning that the methods for capturing, interfacing and converting the ambient energy should be understood and characterized for every application. This thesis investigates the harvesting of the energy found in pressure fluctuations in hydraulic systems, a widely used power transmission system used in the industry and consumer applications; the focus is on the fluid interface and energy focusing methods. In summary, the contributions in this thesis show that the methods for converting pressure fluctuations in hydraulic systems to electrical power depend on the hydraulic system environment, in essence, the static pressure and the frequency of the pressure fluctuations. The results can serve as a starting point in the research, design, and development of hydraulic pressure energy harvesters.